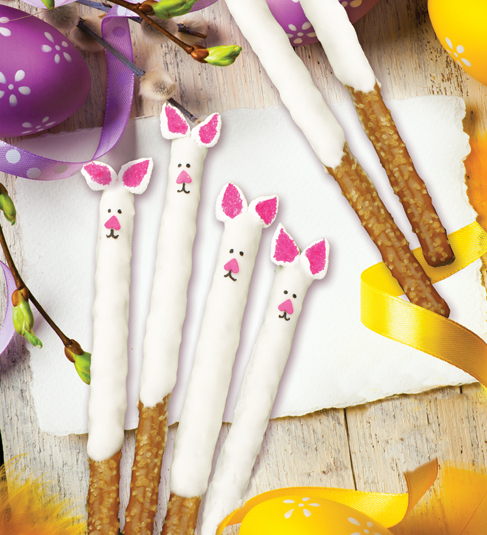 A cute and simple treat that is perfect for Easter and Spring! 1. Cut each marshmallow in half diagonally. These will form the bunny ears. Sprinkle with pink decors onto the sticky side of the marshmallow (for best results, press the sticky side of the marshmallow into the sprinkles). 2. Melt Vanilla CANDIQUIK® Coating in Melt & Make™ Microwaveable Tray according to the directions on the package. 3. Dip about ¾ of each pretzel rod in the Vanilla CANDIQUIK® and place on wax paper. 4. Before CANDIQUIK® Coating has set, press the marshmallow ears on the top of the pretzel, holding in place until set, and press one heart-shaped sprinkle on as the nose. 5. Once dry, draw two dots for eyes with black edible marker or cake writing icing.